Following last weekend's BarCamp  in Tbilisi, one of the event's main organizers, Giga Paitchadze, briefly considers its success and provides a small glimpse into the Georgian blogosphere. Also known as DvOrsky  [GE], the blogger claims to be the oldest  in the country. 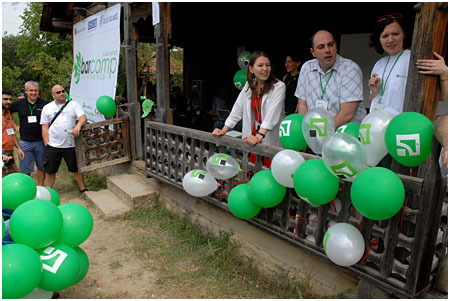 Global Voices Online interviewed Paitchadze after the Caucasus BarCamp . In that sense, I think that BarCamp Caucasus achieved this goal. And I am positive about this since I have also read some reports and blog posts  by those attending the BarCamp – for example, the meeting and some discussion held between Armenian and Azerbaijani participants. This is a small but important success. Editor of Internews Armenia's E-Channel  [AM/EN], Gegham Vardanyan, tells Global Voices Online why he attended the Caucasus BarCamp. However, regardless of the role the Internet played, one Armenian participant was unhappy with Vardanian's presentation  on blogs and new media during the recent presidential election in Armenia . The blogger in question considered the presentation more negative than positive for Armenia's image abroad. Speaking in Yerevan this week, Media Diversity Institute Director and Global Voices Online Author Artur Papayan  briefly addresses such concerns and also elaborates on the role of the Internet during the disputed vote and post-election unrest. Onnik Krikorian will be making a presentation on the role of blogs and the Internet on the democratic process as part of a panel, The Wired Electorate in Emerging Democracies, at the Global Voices Online Citizen Media Summit  in Budapest, Hungary, on 27-28 June 2008. An interview with Emin Huseynzade on the Azerbaijani blogosphere is here . Other Global Voices posts on blogging in Armenia during and after the 2008 presidential election are here  and here .